This dialog box is a wizard which guides you to prepare your first comparisons. When you are accustomed, you can activate the "Jump directly to final page next time" option. NB: This is a helper box. ECMerge lets modify all the parameters of a comparison directly from the source combos and toolbar (including 2/3 way, diff/merge, options and comparison type). First screen is a greeting page, press Next to skip it. Select "Do not show this page again" if you do not want to see it again. Second screen " Which Document Type?" Third screen " Diff or Merge?" This page guides you into choosing Differentiation or Merge mode. Fourth screen " 2-way or 3-way?" This page explains when to choose the 2-way or 3-way mode, 3-way mode helps you work with multiple parallel versions. The final screen: it allows you to review your choice and modify them, then choose either two or three items to compare or merge. The Comparison Type list let you choose the type of document to open (Text, Image, Binary or Folder). The Left/Ancestor/Right location drop down lists contain the latest items that you have recently compared. Select the left and right items in the drop down lists, or click on the button to browse the file system and select a file. If you open the drop down menu, you will be able to select files or folders from both Local File System and Web sources. You can also directly type a file/folder name or a FTP/SFTP URL in the text edit field. More info about the FTP URL syntax. another location you can specify using the drop down list or the button. You can leave all or some source fields empty and select the result path only when validating your merge work. 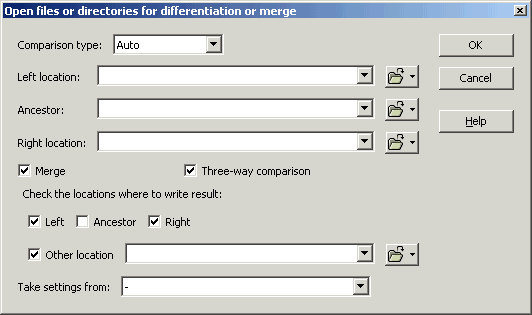 Check the Three-way comparison checkbox to enable the ancestor source. When you click on OK (or press Enter), a new tab containing the comparison document is displayed in the main Ellié Computing Merge window. The file paths that you specify are stored in the recently used lists for their corresponding roles (ancestor, left, right or result). The result location information is optional. You can set it or modify it later in the document options (Edit menu or in the toolbar). When saving a merge result file, if the result location has not been specified, you will be prompted to select the result location(s) with the icon corresponding to the desired result item(s). You can also open an empty comparison view for Text or Binary Files, Images or Folders. To open a new text file comparison, you can press the toolbar icon, type Ctrl + L or select Document / Comparison/Merge / New Text File Comparison menu item. To open a new image comparison, you can press the toolbar icon, type Ctrl + I or select Document / Comparison/Merge Document / New Image Comparison menu item. To open a new binary comparison, you can press the toolbar icon, type Ctrl + Shift + B or select Document / Comparison/Merge Document / New Image Comparison menu item. To open a new folder comparison, you can press the toolbar icon, type Ctrl + M or select Document / Comparison/Merge / New Folder Comparison. Three empty areas where the compared files will be displayed take up the main part of the window. Above each file pane is an entry field that you can use to enter the path to a file or a folder that you want to compare. You can select one of the most recently used path by opening the drop down list. The button opens a contextual menu. Click on the folder icon to open a file-browsing window. Click on the arrow to open the menu. You can use this dialog box to choose binary files. A message box will indicate you if the files are identical or different, and no tab will be displayed in the Ellié Computing Merge main window. The Options Set combo box allows you to start a comparison with another Options set than the default options set. Press F1 or click on the Help button while in this dialog box will show this topic.